We are excited to announce that Xploree Search and Discovery platform is partnering with the major search provider Yahoo! to enrich search experiences across apps on mobile devices. This partnership is significant for us and will improve the way how users search and engage with our platform. It is also an important milestone for us since it comes within just 3 months of Xploree’s commercial launch. Xploree platform will display custom Yahoo search label which when clicked will lead users to Yahoo! Search experience. “Our study has shown that 15% of app interactions on mobile devices have been with a clear intent to search,” said Sumit Goswami, CEO – KeyPoint Technologies. “With Xploree, we are thrilled to offer users a seamless search experience powered by Yahoo within their mobile apps. We see this integration as a key enabler in hyper-contextual search across apps on mobile and are confident that it will transform the users’ app experience” he added. 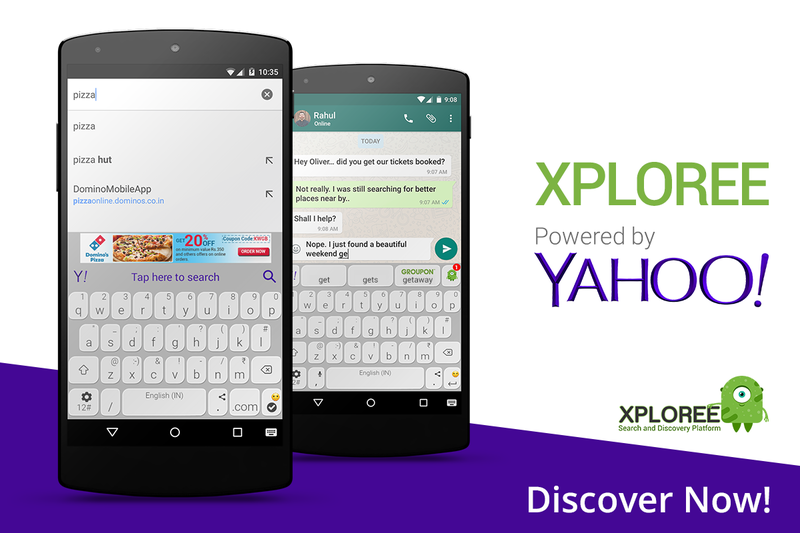 Xploree offers users a seamless search experience, powered by Yahoo, in one tap across apps. No need to launch a browser, or an app; search on mobile was never simpler before. Our studies showed that there is a 5-6 hop cycle as a user leaves the app to retrieve relevant information and get back to their original activity/app. Xploree solves this problem by reducing this to a 1-2 hop/tap process. Example: A user chatting with a friend about a recent movie can instantly check its ratings on Rotten Tomatoes from within the chat app in one hop, without exiting the app. All such actions which simplify a user’s journey and lets users search and discover information within the app they are engaged on, significantly elevates the brand engagement. According to Yahoo ‘over half of those that are doing product research didn’t have a brand in mind.’ To reach users during their search intent on mobile gives a huge opportunity for brands and businesses to connect to their users at the right time with the most relevant results during search queries performed while using Xploree. What’s more, our platform empowers the mobile marketers, brands and businesses to engage with their users through a completely new channel that helps them compete better in the crowded digital marketing space. Mobile search value potential can be gauged from Xploree’s beta studies for the ten most popular categories of applications for consumer search on mobile devices. The results show that search engines lead the pack at 34% followed by call directory at 17% and play store (app discovery) at 16%. Consumers lean in on m-commerce search and social apps heavily albeit, slightly lower than the in-app search on messaging apps (12%). As mobile continues to be the preferred choice of consumers for product research and real-time information, mobile search will only continue to surge in the coming years. Welcome Yahoo! to our esteemed partners list! We look forward to a fruitful relationship that benefits and delights our users. Xploree is available in India, get your smartphones out and download Xploree with Yahoo search on Google Play. It’s free!